This seems like it would be viable in Oath. Any other thoughts? Well, copying Legends in nonbo, so what are you copying? Sun Titan? Inferno Titan? Is Breath just better in most situations with the Oath creatures normally used? I like this new Jumpstart mechanic! I do like this in Rune-Scarred Demon Oath. Not sure if that's still a good enough strategy, but it really fits in well. It was good enough when I tried it out a while ago. Copying the Archon from battlebond seems quite powerful. The biggest problem with this card is that it’s completely dead until you get one of your creature targets into play. While there are some fringe scenarios where a second copy of a creature can turn around a lost game (even with legends like Griselbrand you can create a copy after attacking as a form of pseudo-Vigilance) the deck space opportunity cost feels too high. The Plow liability is also worth mentioning. 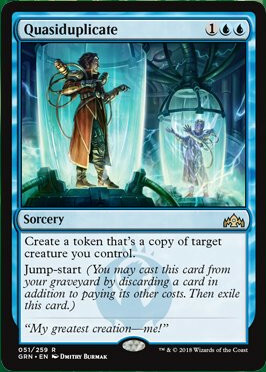 The mechanic itself has a lot of potential, though, since discarding is often not such a cost in Vintage. @evouga It's blue. So not completely dead. I'm doubtful on this one too, but it might make slightly lower power creatures more viable, and therefor let you play slightly more low-to-the-ground, castable creatures because when you get them in play they will be a much greater statistical threat with this floating around in your deck. Yeah, Titans for example. Exactly. Is that slower, grindier way of playing Oath actually better? Unclear. What happens If we put this in Landstill? Copy Snappy? Copy Factory? Copy Champion of Wits? Is that good enough value? What happens if we put 1 in Survival Salad? Is it garbo (probably) or a late game backbreaker that becomes an extra Vengevine you cast from the graveyard? Hmm, are there Oath creatures that win the game on the spot in duplicate? Yosei probably does in most board states (keep cloning/Oathing copies to take indefinite virtual extra turns) and is hard-castable. Are there other back-breaking leaves-play or enters-play effects? Or taking another angle, what's the best hasty evasive creature these days?